September in Africa was all about startups, with a host of top events and the launch of new accelerators as well as the usual funding rounds, acquisitions and new product offerings. Startup pitching event DEMO Africa took place outside of Kenya for the first time, with 40 startups pitching to entrepreneurs, investors and international media in Lagos, Nigeria. Speakers at the event included communication technology minister Omobola Johnson, Tony Elumelu, chairman of Heirs Holdings, and Jason Njoku, founder of iROKO. French operator Orange launched its startup accelerator – Orange Fab – in the Ivory Coast, which the company says as aimed at supporting new digital players and helping them grow. Orange said it hopes to facilitate the development of startups in the Ivorian tech scene, and has already chosen four companies from 86 submissions. 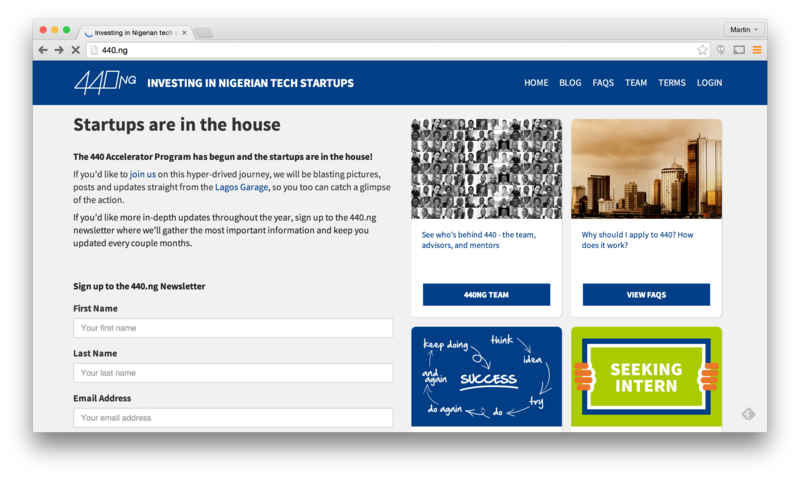 The 440 program in Lagos, a joint venture between African investment funds 88mph and L5Lab, is also in the process of selecting startups for its first Nigerian programme. 10 startups are set to receive investment of between $20,000 and $110,000, and be admitted into a three-month accelerator programme, where they will be mentored by the likes of Stanbic IBTC executive director Obinnia Abajue, Mavin Records founder Michael Ajereh, aka Don Jazzy, and Obinna Ekezie, co-founder of Wakanow. Another incubator adding new startups is the Nigerian government-supported iDEA, with the country’s minister of communication technology Omobola Johnson announcing the addition of 70 startups at DEMO Africa. Johnson said the new startups are the latest addition to the country’s fledgling ecosystem, and also announced the first close of the government seeded IT Innovation Fund will soon take place. Again in Nigeria, Lagos incubator hub the Co-Creation Hub (CcHUB) launched a US$500,000 seed investment fund for early-stage-startups, with sums of between US$10,000 to US$25,000 expected to help startups with business models and operations. The first beneficiaries were startups Vacantboards, Truppr, Traclist, 500shops and GeniiGames. Kenyan incubator Nailab held its Demo Day, with four startups earning a total of KES1 million (US$11,000) each in funding. Mobile stock simulation game Hisa Play, online errand tracking platform TasKWetu, online fashion hub Mode Mara, and e-commerce fashion company Young Freddie Collections were the recipients. Meanwhile, in South Africa Byte Orbit announced the launch of the third edition of its annual Startup Knight competition, which it says empowers aspiring tech entrepreneurs in South Africa. The winner stands to benefit from ZAR250,000 ($22,000) in prizes from the competition, which is themed “Technology That Enables”. In other startups news, startup bus organisers AMPION launched a crowdfunding campaign named “Adopt a startup”, which allows supporters to support an individual entrepreneur or startup with donations of €99 ($125) and above. Mobile money continues to prosper in Africa, with innovative new value added services regularly being launched. 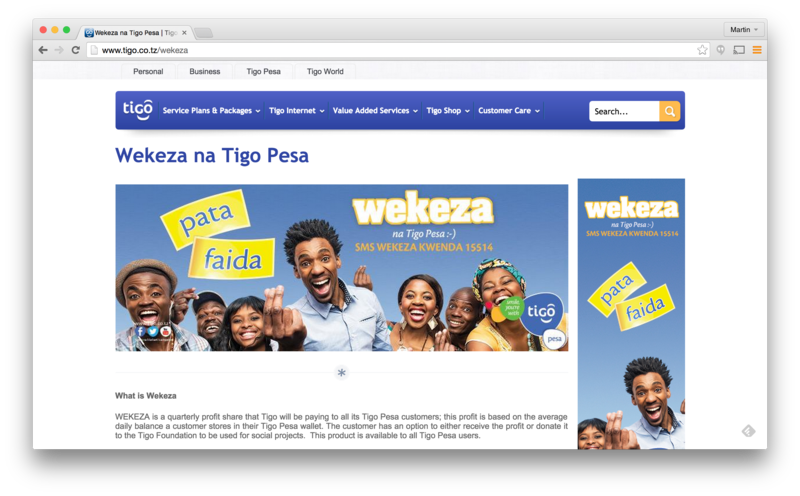 Tigo Tanzania has launched Tigo Wekeza, or “Tigo Invests”, the world’s first mobile money service which allows users to earn automatic returns on the balance in their wallet, while customers can also nominate a non-profit beneficiary. Meanwhile, another pan-African operator – MTN – announced a partnership with online payments company Skrill, which is set to enable MTN subscribers to make purchases from global online brands integrated into Skrill’s network using funds in their MTN mobile wallets, with the partnership being piloted in Ivory Coast and Rwanda. Tigo is also entering the music streaming sector, with Tigo Music set to be launched in Ghana in the fourth quarter of this year, providing users with access to 30 million songs.Millicom, which owns Tigo, said the service is already available to 600,000 subscribers in Latin America, and that it had partnered with digital music company Africori to acquire and manage the rights to the songs on its catalogue through “Africa Music Rights” (AMR). European mobile company Wiko has launched its portfolio of 10 phones in Kenya, boasting of world-class technology, cutting edge design and exceptional product quality. Wiko International Business Director Marcel Van de Pas said Wiko was delighted to launch its brand to Kenyan consumers, and said he was confident “combination of stylish design, technology, quality and pricing will be a huge success here”. Meanwhile, Tecno launched the Phantom Z in Ghana, saying the device has an expandable memory up to 32GB, a 5.2 AMOLED HD display and Gorilla Glass. The phone allows 26 hours of talk time and runs on Android 4.4.2. Payments company Interswitch Transnational Holding acquired a majority shareholding in East African payments provider Paynet Group, which will see a new combined network connect over 100 financial institutions to create what Interswitch calls an unrivalled payment infrastructure across East and West Africa. PayPal partnered South Africa’s PayGate to help further strengthen its presence in Africa, with the partnership allowing PayGate merchants to add PayPal payment options to their online stores, while non-profit tech startup mWater has partnered Water.org to launch a platform making mobile monitoring and evaluation of water available to anyone for free. mWater Surveyor is designed to increase the capacity of local and global actors to gather data on water, monitor work and collaborate for greater impact.